At Last! A Simple, No B.S. Solution For Fixing Common Hitting Mistakes! Discover 22 Game-Tested Drills To Fix ANY Hitter's Mechanics, Make Better Contact, and Get More Base Hits! For a softball player, there's nothing more frustrating than struggling at the plate. And for a coach (or parent), there's nothing more heartbreaking than watching a kid strike out over and over, no matter how hard she tries. Here comes the pitch... belt-high... right down Broadway. Her eyes light up with anticipation. Strike three. Back to the dugout with slumped shoulders and a face like a wet blanket. Did she dip the back shoulder and uppercut? Roll the top hand over too soon? Or maybe her problem is just a "slow" bat? It all happens in the blink of an eye. And even for experienced coaches, it's almost impossible to spot the mechanical errors your hitter is making. This Step By Step Guide Reveals The 8 Most Common Hitting Faults And Shows You Exactly How To Correct Them! Read this simple eBook and discover the EXACT hitting faults that plague 95% of all kids at the youth and high school level. This is not some 584 page textbook on the biomechanics of the swing. If that's your bag, you should probably look elsewhere. But if you're a busy coach who wants the boiled down, nitty gritty FACTS about how to isolate common hitting problems and correct them FAST, then this will be like manna from heaven. How to fix Uppercutting or Dipping... and develop a smooth, compact, and EFFORTLESS swing that will have Div 1 recruiters drooling! How to fix Stepping Out or Flying Out... so you can load up the swing with the correct timing, and unleash on the ball with the "pop" of a nuclear powered windmill! How to fix Head Jumping or "No Back Side" Hitting. With one simple tweak, you'll immediately recruit more power from the hips, quads, and core... and send more concentrated juice into the ball! How to fix Poor Ball Tracking... so you can easily track the pitch from the release point, understand its trajectory, and make more solid, more consistent contact at every at-bat! How to speed up a Slow Bat. Discover how to develop quicker hands, quicker hips and boost your bat speed through the roof! How to fix Poor Hand Position... so you can get the "sweet" part of the bat right on the ball, make better contact, and get more base hits! How to stop Locking Out the Arms... and develop a powerful, flexible swing that covers the entire plate, and CRUSHES off speed pitches as well as fastballs!. Don't worry if you're new to coaching. There's no "insider" talk or biomechanical mumbo jumbo. Everything is plain English and straight to the point - so you can absorb it fast and apply it with your team. c) What your hitters SHOULD be doing instead. Then, we'll dive into some simple, fun and effective practice drills, specifically designed to correct the mistake and improve your hitter's mechanics. Hammer Drill: trains the hitter to STOP uppercutting and start swinging on a short, downward plane to the ball. Say "goodbye" to those weak pop flies... and "hello" to towering line drives! Fastball/Curveball Bounce Drill: an awesome practice drill that helps develop pro-level pitch recognition, timing, and rhythm. Medicine Ball Drill: develops explosive fast-twitch strength throughout the entire "kinetic chain" of the swing - for more bat speed, more power, and more base hits! Pinto Bean Drill: got a great swing but can't make contact? Your hitters EYES may be the problem... and this fun drill will quickly help her develop laser-like vision and "fine focus" in the batters box. Color Ball Drill: all you need is standard softball and a few magic markers, and you'll have an amazing training aid that improves concentration, boosts pitch tracking skills, and helps your hitters make more solid contact! Isometric Swing Training: this fun drill progression is hard work - but it'll immediately pay off with stronger arms, shoulders, forearms, and wrists... and dramatically faster bat speed! So You Can Start Using These Drills Tonight! To shorten the learning curve and really make sure you and your players "get" this stuff immediately, every drill is explained with step by step instructions, full color images and detailed coaching pointers. Hitting Faults and Fixes is an essential part of any serious coach's library, whether your'e brand new to the game, or you've been coaching for years. The drills and concepts you'll learn WILL translate to better performance at the plate and more base hits, no matter what level you play at, or how much your hitters are struggling right now. Sure, I've been studying hitting mechanics for a long time - but I still consulted every hitting expert I knew, and personally tried and tested dozens of different drills with my own players while developing this system. Much of the credit goes to the legendary hitting instructor Larry Price - one of the premier high school coaches in the Western United States. He’s racked up 12 Idaho State Championships through his American Legion and High School teams… won 9 Coach of the Year awards…and sent 62 of his players on to receive college scholarships. These techniques have worked for Coach Price... they've worked for me... they've worked for hundreds of other coaches. And they WILL work for you too. Hitting Faults and Fixes is delivered to you in PDF format, so you can get instant digital access... right over your computer screen, smartphone, tablet, or eReader... from anywhere in the world with an Internet connection! That means you can download these tips to any device (or print them out) and bring them to practice tonight! The drills contained inside are simple, proven and FAST to learn, so you can start using them at your very next practice (tonight if you want). I've pulled together in one simple collection, every technique you'll need to isolate and correct the mechanical mistakes that are killing your hitters right now. 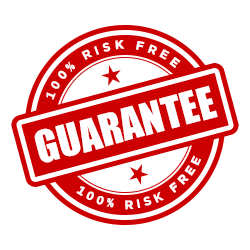 This system is guaranteed to work with kids of all ages, from Little League through High School and beyond - no if's, and's or but's about it. So if you're serious about becoming a better coach, and if you would like to instantly have a proven plan to develop top-notch mental hitting skills, click the Add to Cart button below now. It's just 35 pages. Short enough to read in one sitting. And to make sure you really hit the ground running, I'm also throwing in an exclusive FREE bonus! 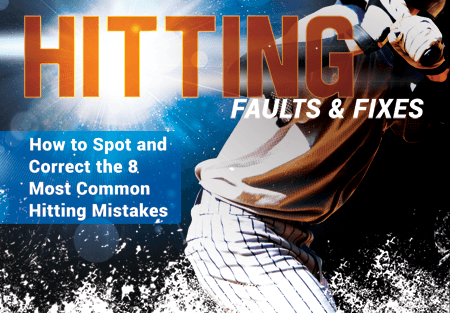 To help you save time and energy, we pulled together a quick "cheat sheet" that summarizes each of the 8 common hitting faults. For each hitting fault, you'll get a quick summary of what the mistake is... how to spot it... how to FIX it.... and what drills will reinforce the proper mechanics you're trying to teach. 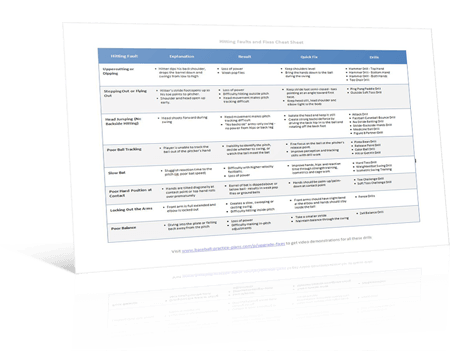 It's a great little printout for your coaching binder, and an invaluable reference for coaches and parents at all levels. Time is very much "of the essence." If you want to develop a dominant youth softball team this season, you need to start right now. This report is so essential I'm practically giving it away because I want to make sure you take the simple steps to helping your girls refine their swings and reach their true softball potential. Click the Add to Cart button below to get instant access to Hitting Faults and Fixes risk free for just $7. YES, I want in! I want access to Hitting Faults and Fixes, plus the Practice Cheat Sheet. Please give me INSTANT access to this step by step system right now! Your report is waiting for you to claim it. Just $7 gets you instant digital access so you can start using these techniques tonight. I've already done the research... spent the time filtering out what doesn't work… and compiling it all into this incredible "best of" hitting drills collection. There's no need to waste your time searching the web for unproven ideas, or spend hundreds of dollars on coaching clinics. Just download Hitting Faults and Fixes and you'll get instant access to a complete training system you can start using today! Hitting Faults and Fixes now for just $7!